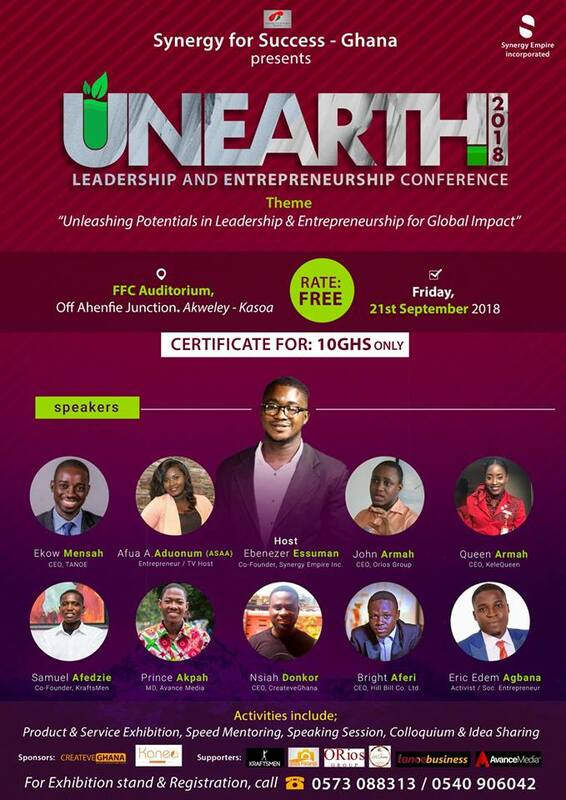 All is set for the gathering of young entrepreneurs and businesses on Friday 21st September, 2018 at the FFC Auditorium, off Ahenfie Junction, KasoaAkwelley for the 2018 UNEARTH Conference. The event dubbed UnEarth 2018 (Leadership and Entrepreneurship Conference) will provide participants the opportunity to network and learn from emerging young entrepreneurs and leaders. This will help to maximize their business and personal potentials for global impact. Leadership and Entrepreneurship Conference which was first organized in 2013 promises to live up to expectations according the organizers, Synergy For Success Ghana. The theme for this year’s edition is “Unleashing Potentials in Leadership and Entrepreneurship for Global Impact”. “UnEarth 2018 will not be the usual talk shop but one that will give participants practical tools from our lineup of speakers and mentors”, says Ebenezer Essuman, conference host. 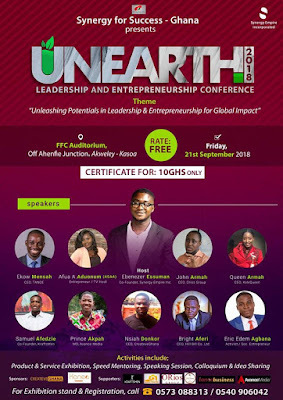 LEADERSHIP AND ENTREPRENEURSHIP CONFERENCE 2018 dubbed UnEarth will bring on board successful young entrepreneurs and coaches from diverse fields of the game to enlighten participants on unleashing their potentials in their chosen field of work. Topics are but not limited how to start your own business, identifying your career path, social entrepreneurship, maximizing your potential. Leadership in entrepreneurship is very important to every young entrepreneur and therefore the conference will take the opportunity to tackle issues on leadership qualities, instincts, characteristics and anything which make a good leader in his or her entrepreneurial role to ensure success. Participation is free (certificate however goes for GHc10). To register, call 0540906042 or 0573088313.